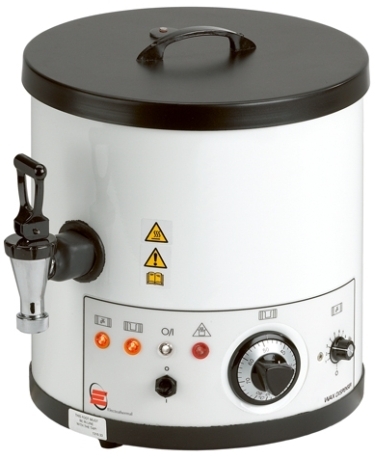 The Electrothermal Paraffin Wax Dispenser provides immediate "Wax On Tap" for Pathology laboratories etc. The problem of wax solidifying at the tap is completely eliminated by the incorporation of a thermally insulated tap heater with independent temperature control. Fitted with safety over-temperature cut-out at 105oC and non-resettable thermal fuse. A built-in thermostat provides temperature control from ambient 75C. Tap Heater maintains temperature within the tap, keeping the wax molten.